Although perhaps Iberico ham tourism might not be the first thought everyone has when looking for a holiday, it's actually both fascinating and well-catered to in the lands of Iberico ham. In each of Spain's prime Iberico regions you'll find at least one Iberico ham trail where you can learn the secrets of this delicacy. Let's find out where they are! What do Iberico ham trails offer? The short answer would be, "everything to do with Iberico ham!" The truth is that if you decide to travel an Iberico ham trail, there will be opportunities to learn everything about how this amazing delicacy is made. You'll see the pastures, and learn first-hand about the beautiful, unique ecosystem that both sustains and is sustained by the Iberico ham industry. You'll also get to meet the pigs themselves, and see these unusual animals in their native environment before they go on to become some of the best sausages and hams in the worlds. 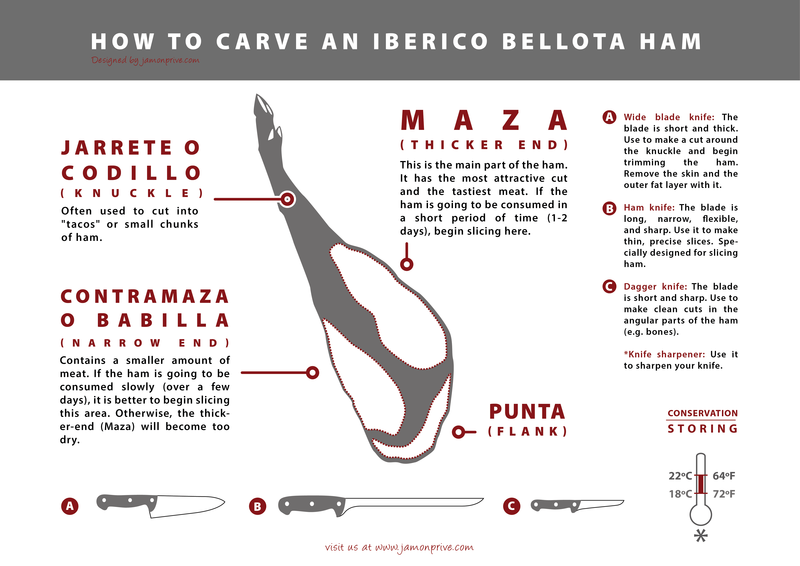 However, taking an Iberico ham trail doesn't just mean seeing one part of the process. Many producers will invite you to their headquarters and show you around their facilities, letting you see the slaughterhouse, the drying rooms, the maturation process, all up close. In addition, you'll get the chance to participate in some of the tastings they offer and learn the secrets of cutting, tasting and "maridaje," or "pairing" ham with other foods and drinks in the traditional way. It's an experience that combines nature with knowledge, learning and sensory pleasure. One of the main attractions of an Iberico ham trail is the natural world in which it takes place. The pastures on which Iberico pigs are reared are part of a unique ecosystem that exists in symbiosis with the Iberico ham industry. Without ham, the pastureland would have changed out of all recognition; without the pastures, the high quality of Iberico ham would be impossible. It's home to an entire culture and way of life, with farming techniques, grazing patterns, working rhythms and ways of living that revolve around Iberico ham. On an Iberico ham trail, you can meet the forests of oak and cork oak that exist in harmony with the Iberico pig, the region's other main natural inhabitant. Iberico pigs have ben bred here for centuries and they and the pastures have adapted genetically to each other. There's also an enormous cultural heritage in the region, represented by the wealth of castles, medieval buildings and the twin traditions of cork and coal production. The third ingredient for quality hams is the knowledge accumulated over centuries and handed down though generations of craftsmen. Without it, Iberico ham would be imposible, and certainly would not be the living cultural artefact it is. If you travel any Iberico ham trail, you'll see the whole process, including the famous curing sheds. You'll also be welcome in the wash room, where the surface salt is removed from Spanish hams before being hung to cure, and the drying room where they undergo their final preparation prior to being hung for curing. After maturation, master ham makers carry out the tests that will allow them to determine whether the Spanish hams have reached the optimal cure for consumption. Without a doubt, on an Iberico ham trail, you'll have the chance to enjoy some of the very best sliced ham available anywhere. You'll often find it accompanied by a historical anecdote or tall tale, or some curiosity regarding the world of Spanish ham. The senses must be awakened to take full advantage of the best Iberico ham, so start with sight before you even take a bite and appreciate the shape and color of a great ham, the intense flavor and the juicy, melt-in-the-mouth texture. Moving onto scent, and then finally taste, it's possible to involve all five senses in the pleasures fo great ham. There's no better time to get started in ham tasting than right now! However, knowing how to appreciate great ham is not everything. 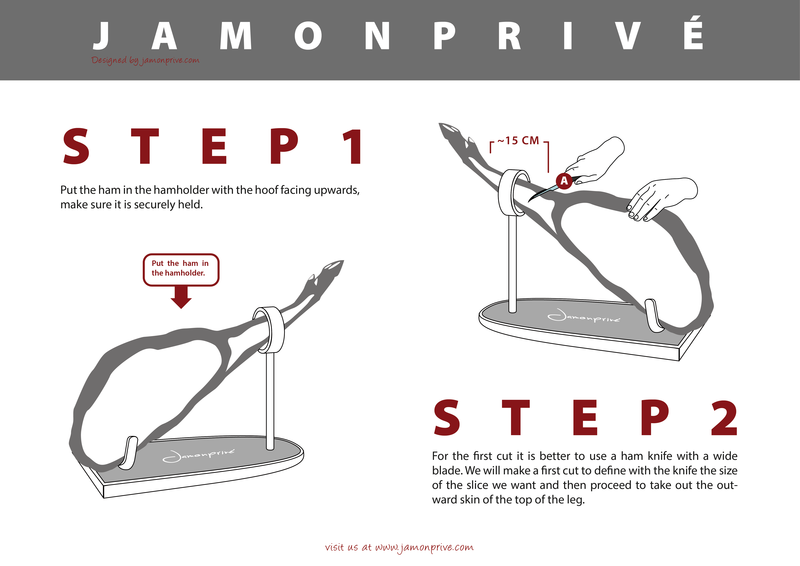 It's also necessary that the ham be cut skillfully, and on Iberico ham trails master ham cutters are on hand to show you how to do this like an expert, teaching you what tools you need, the right positions for your hands and body, where to start and finish cutting and what the slices should look like, and how to consume and store your Spanish ham. The various municipalities contain ham producers who have worked hard to reach out to Spanish ham lovers from all over the world and show them the way in to the world of Iberico ham. The Jabugo trail, for instance involves 31 municipalities in the DOP of Huelva, where several producers, farmers, hoteliers and restaurateurs, as well as hotels, inns and tourism information centers, are open to the public. The Montáchez trail, with 19 villages and a centuries-long history of prestigious ham making, also has many hotels, restaurants and information centers. The Los Pedroches trail, meanwhile, runs through 31 municipalities in the Cordoba province, and takes in some of the best preserved pastureland in the entire peninsula. The final option is that of the Sierra de la Badajoz trail, running through 33 villages of Iberia's most entrenched ham culture, where you're likely to run across local ham competitions and tastings, as well as where the biggest ham fairs and events occur. Without a doubt, then, the best way to find the people who can open up to you the world of traditional Iberico ham is to follow an Iberico ham trail and discover the secrets, passed from generation to generation, that made Iberico ham what it is: one of the world's most prized delicacies!